The New Jersey Devils ownership situation has been a precarious one in recent years, with a large debt load and cash flow issues. Bankruptcy was, according to some reports, on the table for current owner Jeff Vanderbeek. The good news is that there are multiple suitors interested in purchasing the team. The bad news is that the NHL, according to Forbes, will take over the team unless a buyer steps up in the next month to take over the franchise. The site reports that the Devils "have $230 million of debt and team owner Jeff Vanderbeek missed the first payment on a recently restructured bank loan." According to three sources, the NHL does not want the Devils to file for bankruptcy like the Phoenix Coyotes did in 2009. The Coyotes were recently sold for $170 million after going through an arduous lease renegotiation with the city of Glendale that kept taxpayers, players and fans in limbo for over three years. Instead, the NHL would fund and operate the team while it sought a buyer. The Devils owe the league roughly $25 million and their payroll for the start of 2013-14 season is projected to be around $55 million. Non-NHL events are down at the Prudential Center, also hurting Vanderbeek’s financial situation. One reason: arena operators prepay a portion of the money they are going to pay acts, like rock bands and the circus, and sources say the Devils do not have the cash to book events. During the first quarter of 2013 the Prudential Center was not among the world’s top 50 busiest arenas. The prior year it was ranked 11th-busiest. OK, so that’s not so good. But the Devils do actually have some interested buyers, and there’s no Glendale City Council to get in the way. See, nothing like Phoenix! New Jersey attorney Andrew Barroway had loaned the team $30 million, and his ownership group had been working behind the scenes to help facilitate a deal. The Bergen Record said that he's still in the mix; Forbes reported he pulled his offer. Barroway previously tried to purchase the Philadelphia 76ers, which brings us to the other horse in the race: Josh Harris, whose group has owned the Sixers since 2011, is now involved with the bidding, according to WIP in Philly and the Bergen Record. Whether Vanderbeek would continue to own some stake if Harris’ group were to follow through with its bid is unknown. Harris’ group has owned the 76ers since 2011, and is believed to be interested in getting into the New Jersey/New York sports market. Multiple sources indicated that no deal with either group was imminent and the timetable for the completion of the sale remained open-ended. 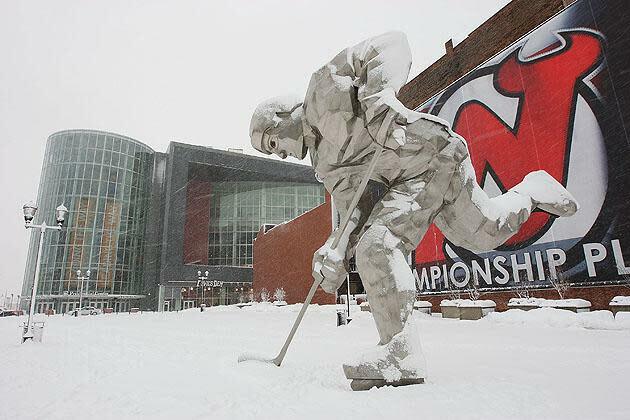 Regardless of which group ends up purchasing the team, the Devils would remain in New Jersey and continue to play at Prudential Center in Newark. That last line, of course, is the most salient one for Devils fans: That relocation would be off the table if either group succeeds in buying the team. And hey, who wouldn’t want to own a team that suddenly doesn’t have to pay $77 million to some Russian dude? So there you go: The NHL might take over the Devils, but somebody wants to buy them. Weird how the latter story preceded the first, huh? A source with knowledge of the ownership process said a deal to complete the sale of the team to one of two bidding groups could be completed “quickly” and estimated it could be only a matter of days. Another source said that timetable might be overly optimistic, but that the process is “close” to wrapping up. “I haven’t seen the Forbes report, but if the suggestion is we’re going to take over the Devils, which is what I’ve heard the report says, it’s not accurate,” NHL commissioner Gary Bettman said today. We shall see. Lord knows the Coyotes sale was close to closing about 500 times and never did until this week.